Backlash is growing over video of a black Columbia University student getting pinned down by campus security. Roseanne Colletti reports. A black Columbia senior was pinned down by campus security, asked to leave the building repeatedly, and had his ID confiscated. The student showed his Columbia ID, which one of the officers took, then walked off with. Multiple reports have been submitted to the Office of Title IX and Equity by witnesses. 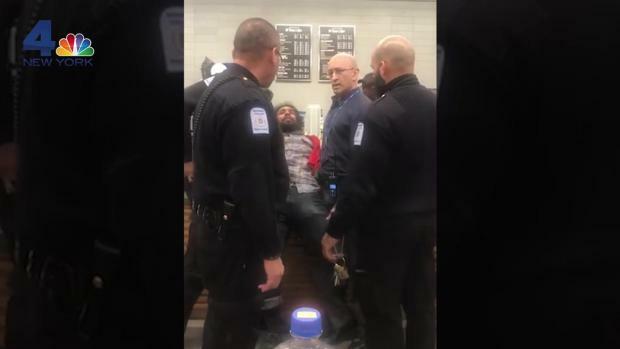 A black Columbia University senior went to get some free food in the Barnard Milstein Center late Thursday night when he was pinned down by campus security, asked to leave the building repeatedly, and had his ID confiscated, video shows. Now six Barnard Public Safety officers have been put on administrative leave pending an investigation. In an interview with Columbia’s student newspaper the Columbia Spectator, McNab said he was aware of this rule, but was frustrated because he saw inconsistent enforcement between white students and students of color. This time when they asked him to see it, he paid it no attention. Cutlip, a member of student government, had brought some food leftover from a student government meeting to the library. They posted about food on a free food student Facebook group. She was there with some friends when McNab walked in to get a plate. "He seemed very calm and friendly," Cutlip said. "Maybe 10 seconds had gone by when two officers came around on either side to grab him by the arms and pull him back toward the counter." 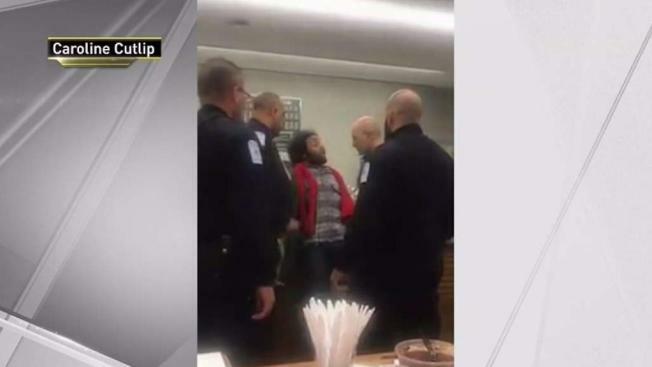 A black Columbia senior was pinned down by campus security, asked to leave the building repeatedly, and had his ID confiscated, video shows. “Walk outside,” one of the officers says repeatedly. The officers also say in the video that they followed McNab because he ran past a Public Safety van and through the gates of the building. Witnesses in the video said he walked. When questioned by a witness defending McNab, an officer walks towards to her and tells her to relax. "I was crying, my friend that was next to me was crying, the girl who was told to relax was crying, it was that moment that made the three of us so emotional because it wasn’t just violent. It was demeaning and hurtful and disrespectful," Cutlip said. The next morning, Cutlip met with a Title IX officer to file a complaint and share her videos. Columbia University Dean of Undergraduate Student Life Cristen Kromm on Friday encouraged students to attend a "reflection session" to discuss the incident. "In light of last night's unfortunate incident with Barnard Public Safety at Barnard College, we recognize the hurt and pain that many students may be feeling," she wrote in a message sent out to students. Cutlip said it "became clear [at the session] that there's a divide between the student reaction and the school’s reaction." "The students were really mobilized, hurt, and angry. The response didn’t mirror that," Cutlip said. A student petition condemning the “racial profiling of and use of force against a black student by Barnard Public Safety” was signed by more than 40 student groups and alumni associations. According to the Spectator, the six officers involved have been put on paid administrative leave pending an investigation to be conducted by an independent investigator.